The 1995 Insignia may be slightly better than the 1994 - as hard as that is to believe. The 1995 Insignia may be slightly better than the 1994 - as hard as that is to believe. The final blend is 90% Cabernet Sauvignon, 7% Merlot, and 3% Petit Verdot. 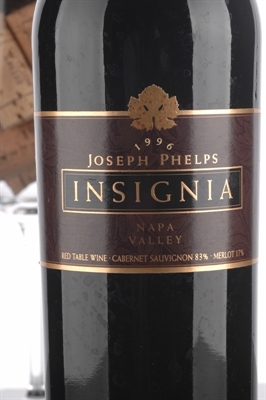 The 1995 exhibits a character similar to the 1994 - cassis, fruitcake, cedar, herbs, coffee, and black fruits intermixed with smoke - but the 1995 is slightly longer in the mouth. It is a wine of extraordinary extraction, full body, and marvelously pure fruit. Moreover, it has managed to soak up the 100% new oak aging, leaving only subtle pain grille notes. The tannin may be slightly more noticeable in the 1994, but my instincts suggest the 1995 is even richer and longer than the 1994 - as amazing as that sounds. This prodigious Insignia should be at its best over the next 20-25 years. Joseph Phelps is doing a phenomenal job with their Insignia. The winery produces 10,000-12,000 cases of this proprietary red wine, all of it aged in 100% new oak. Vintages since 1991 have been superb. Perhaps the best back-to-back vintages ever produced of this wine are the 1994 and 1995, which rival the great Insignias made in 1974 and 1976.